Finally, it can be told: the vaunted case that launched the loosest cannon in the English legal system on his nonpareil career (Rumpole and the Primrose Path, 2003, etc.). Fresh (very fresh) out of Oxford in the early 1950s, Horace Rumpole is farmed out to the chambers headed by C.H. Wystan, Q.C. Under the glazed eyes of risk-averse Wystan and golf-obsessed pupil master T.C. Rowley, Rumpole seems unlikely to get into trouble. 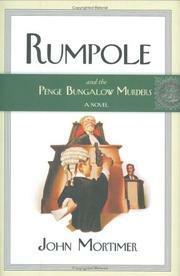 Circumstances and Wystan’s spirited daughter Hilda, however, conspire to get Rumpole appointed junior counsel in the defense of Simon Jerold, accused of shooting his father Jerry, an ex–RAF pilot, and Jerry’s rear-gunner Charlie Weston, following a well-witnessed quarrel about military heroism. The boy’s vigorous protests of innocence fail to impress either Barnsley Gough, his solicitor, or Wystan, who agree that the best defense is stiff-upper-lip silence before fearsome Chief Justice Jessup. Nor do Rumpole’s diversions—the defense of a habitual burglar only too eager to plead guilty despite his obvious innocence and the odd breakfast with Hilda—promise much more fulfillment. But irrepressible Rumpole’s soon elbowed his superior out of the Old Bailey, taken over Simon’s defense, and plumbed a mystery that wouldn’t fool anyone but a child, or a senior member of the bar. The real and considerable joys here are watching Rumpole spread his wings and observing, in what passes for his courtship of Hilda, the seeds of his thrall to She Who Must Be Obeyed.